Kuta - Bali is probably the most popular and certainly the most well-known resort destination on the island. 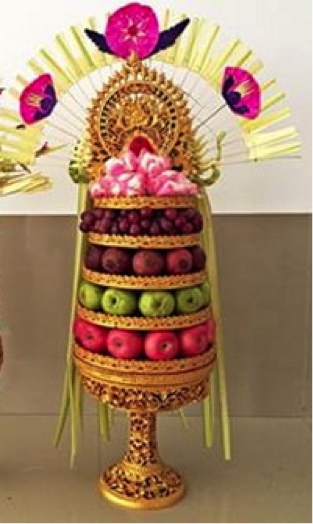 Hotels in Kuta Bali are always on top of the wish list of many visitors and Kuta Bali hotels include some of the most popular Bali hotels. Kuta is an icon in many parts of the world and for many people the world over it evokes thoughts of fun, surf, sand and sea. The attractions of Kuta are bustling nightlife, being the place for Kuta shopping in Bali and a myriad of Kuta Bali hotels and restaurants. To many visitors, the neighborhoods of Tuban, South Kuta, Kuta and Legian are not really clearly defined, and most refer to all of these different sections as "Kuta". However, to make it easier to find hotels in Kuta Bali and not to confuse our visitors, we have separated the area into 3 sections. This page relates to Kuta as meaning the area from Kuta Square with the Matahari Department Store until just before the right turn at Kuta Beach Road. The area south of it or from the International Airport onwards has its own page, South Kuta & Tuban. The area just north of Kuta, can be found under Legian. Kuta, with its famous stretch of beach and hundreds of Bali Kuta hotels, shops, restaurants, bars and nightspots, has been the "center of the action" in Bali for many years. It offers many smaller and moderately priced Bali Kuta hotels, bed and breakfast inns, as well as some larger, international standard hotels in Kuta Bali, several of which are located along the beach. The main attraction along the beach is the Beachwalk Shopping Center. It offers a great variety of shops, eateries, a cinema and other interesting venues. It`s become a "must" to visit whilst in Bali. Walking from the beach road in a southerly direction, towards Tuban, you will first reach Kuta Square with the familiar and ever popular Matahari Department Store. In the same area, one can find great deals for branded clothing, such as Levis, Polo, Prada, Armani, Dolce & Gabbana. The Kuta Art Market, just a bit further on, is a good place to bargain for local crafts, souvenirs, paintings, T-shirts, bags, sandals, sarongs and other casual wear. Continuing in this direction, more Kuta Bali hotels, shops and restaurants are to be found in this area called South Kuta. - Other options for nightlife and restaurants are concentrated along Jalan Legian, as well as in the lanes connecting this well-known main street with the Kuta beach road. Some of these areas are already part of Legian. Adhi Jaya Sunset Hotel is strategically situated along Sunset Road Kuta Bali, 20 minutes from the international airport and with easy access to a variety of commercial, retail and entertainment choices. 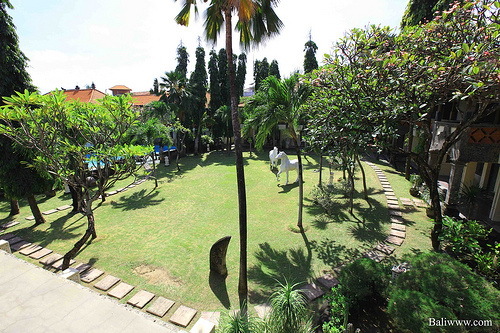 Agung Putra Hotel is located in the well-known Poppies Lane in Kuta Bali. It`s only 15 minutes from the international airport, just a few minutes walk to famous Kuta Beach and with easy access to shopping, restaurants, Pasar Agung Art Market and the nightlife of the Kuta and Legian areas. Al-Isha Dharamshala is located off Sunset Road, near its intersection with Jalan Imam Bonjol and near Carrefour supermarket. It`s about 20 minutes from Ngurah Rai International Airport and about 10 minutes drive to Mal Bali Galeria at "Simpang Siur" traffic circle. Alron Hotel is located in the commercial area of Kuta, with easy access to Kuta beach, shops, market, minimarket and restaurants, as well as the main road leading to the various tourist attractions of Bali. It`s about 15 minutes from the International Ngurah Rai Airport. Bakung Sari Resort and Spa is located near a variety of shops, restaurants and the nightlife venues of Kuta. It`s just 10 minutes from the international airport and in easy walking distance to famous Kuta Beach. Bali Kuta Resort is a four-star hotel located in the Kuta area. It`s about 20 minutes from the airport, 5 minutes to Kuta beach and it has easy access to entertainment venues, tourist attractions, exclusive shopping and sightseeing in the Kuta, Legian, Seminyak and Nusa Dua areas.